When Sadiq Khan took office as Mayor of London in May last year, his first job was to go through the outgoing Mayor’s Inbox. 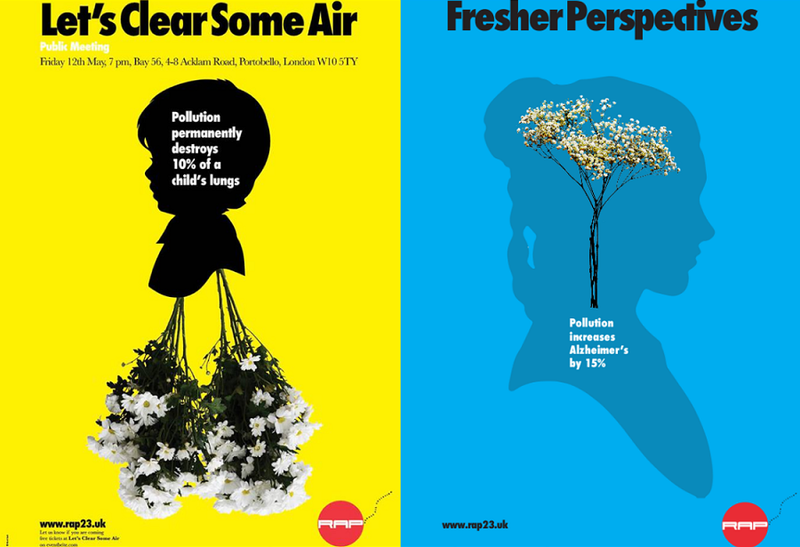 Among other horrors was an unpublished report on air pollution near primary schools in London, and RBKC came very high on the list of most affected areas. The combination of the Westway, west-east arterial routes such as Fulham Road, Brompton Road and Kensington High Street, and the railway in the north, emit a deadly cocktail of pollutants and particulates which affect us all – and particularly young children. Below you will see just one month of alerts. The highest acceptable level of NO2 is given as 40%, however St Mary Abbot’s reached an appalling level of 56% in 2010, the highest in the borough. 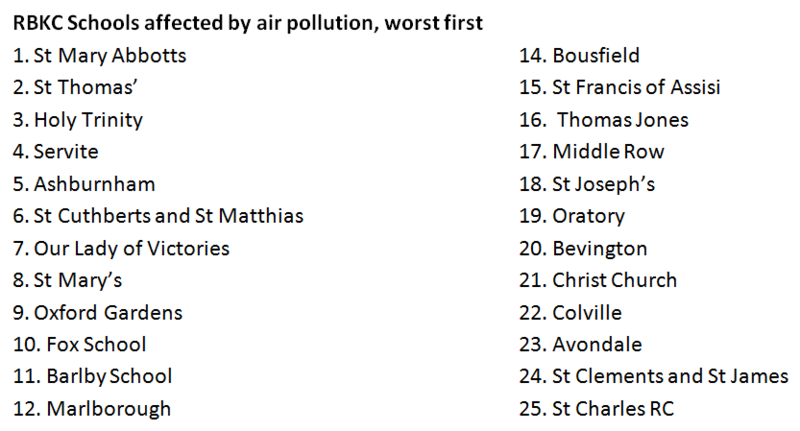 St Thomas’ in Golborne ward, right next to the diesel particulate-emitting Great Western Railway, is in second place with an equally shocking 54% in 2010. While both schools improved slightly in 2015, they were still well over the level permitted. In 2015 I was hospitalised with pneumonia and lost a quarter of my lung capacity. It’s been a long recovery and I now have asthma. On bad air days my chest tightens and I struggle to breathe. I’ve lived in the borough nearly all my life and I’m sickened that we are seeing more bad air days. I well remember the last major smog in 1962; I couldn’t see either side of the pavement and barely managed to get home. 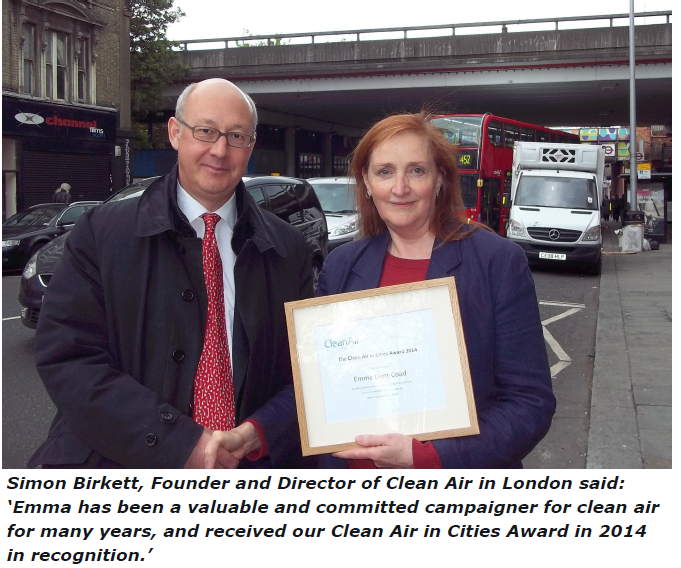 Ov er the years I have been involved in a number of campaigns, and won a Clean Air in Cities award in 2014. I have been working with City Hall to bring in more assertive anti-pollution measures without delay. We need to set up a Bad Air Day alert system for schools so children do not play outside, and demand that RBKC Council gives the new Mayor every support in his plan to tackle air pollution. 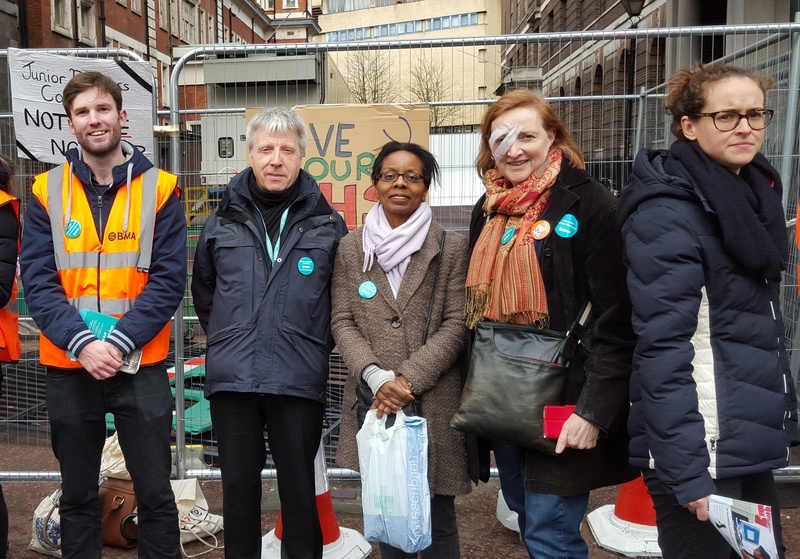 Kensington Labour Councillors have set up a new petition to demand that the Council introduces a 20mph speed limit on borough-controlled roads, and I support this as it improves air quality and road safety, as well as generally improving the environment. In early April ministers from DEFRA had sought to delay the release of a key report on government plans to meet EU air pollution standards until after the election, but was ordered by the courts to publish it. 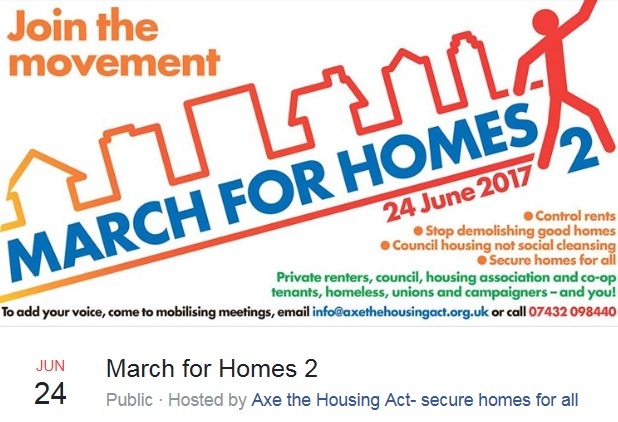 Labour says almost 40 million people are living in areas with illegal levels of NO2. This figure was based on data released in 2015 which identified 169 local authorities as exceeding the limit. Outdoor air pollution contributes to some 40,000 early deaths a year in the UK, say the Royal Colleges of Physicians and of Paediatrics and Child Health. NO2 comes from sources including factories and vehicles, particularly diesel engines. The government was told to take immediate action by the High Court in April 2015 to cut air pollution after it was found the UK had breached EU limits for NO2 in the air. Campaigners ClientEarth, an environmental law firm, took the case back to court last November saying the government’s plans did not go far enough. Judges ruled in their favour saying the government’s proposals to improve air quality were “woefully inadequate” and ordered it to publish an updated draft plan by Monday. The UK was sent a “final warning” over air pollution by the European Commission in February. 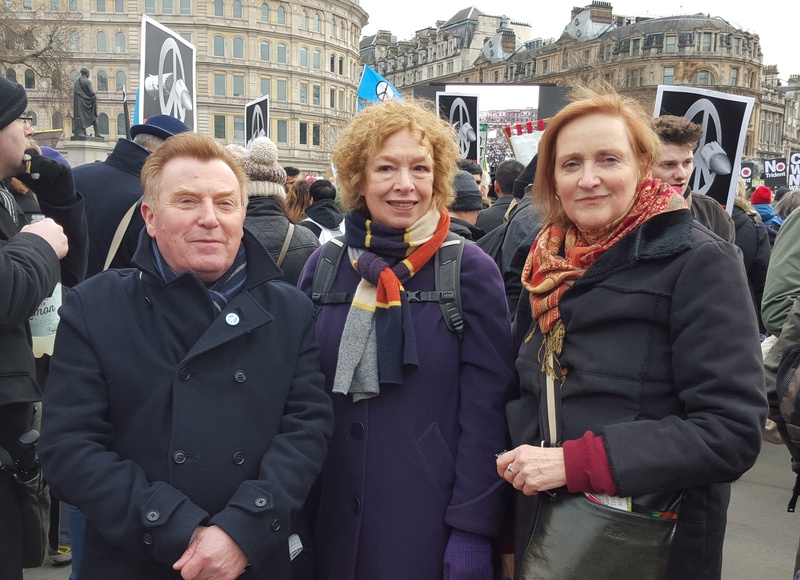 The Labour Party has condemned the government for failing to act on this ‘public health emergency’ and has vowed to bring in a new Clean Air Act with Clean Air Zones declared in most affected areas. 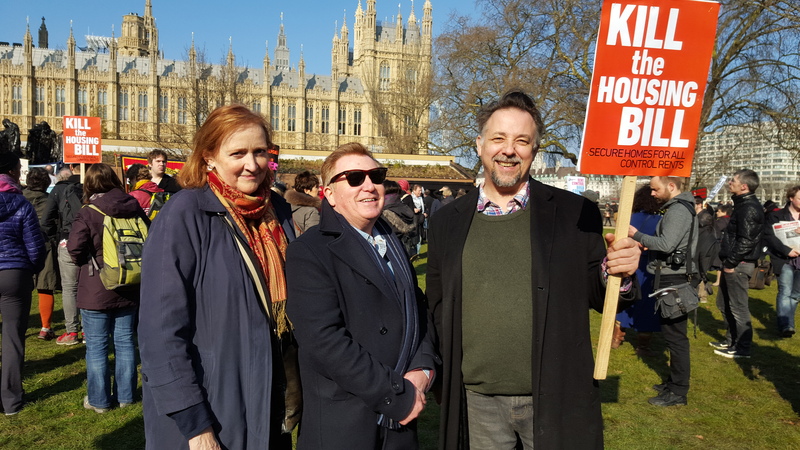 We will always support local campaigns where possible, let us know on kensingtonlabour@gmail.com if you would like your local Labour party to support you. And send us your photos! 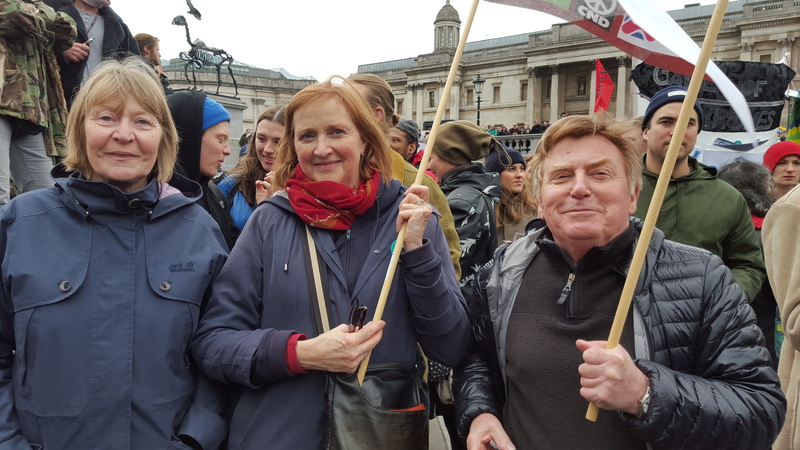 An increasing number of members attend marches and protests, so we have recently acquired some wonderful Kensington Labour flags, that also proudly proclaim our affiliations to the Palestine Solidarity Campaign, Campaign for Nuclear Disarmament, and Republic, campaign for an elected head of state. Do join us. 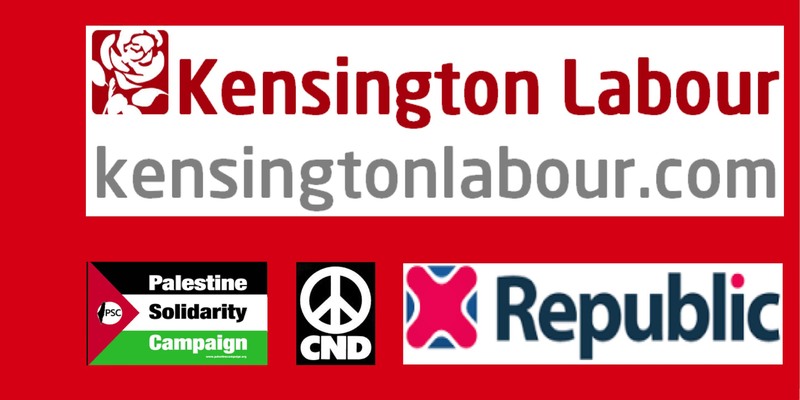 We post meeting places on the Kensington Labour Facebook page so you can find out what we are doing. Let us know if you’re coming so we don’t miss you!